CBS has officially named Stephen Colbert as the new host of the Late Show, signing him to a reported five-year deal to take over as soon as David Letterman retires. The announcement ends a discussion that has become incredibly intense in the days since Letterman officially announced that he was leaving sometime in 2015, whereupon he immediately began fading like a photograph in Back To The Future. 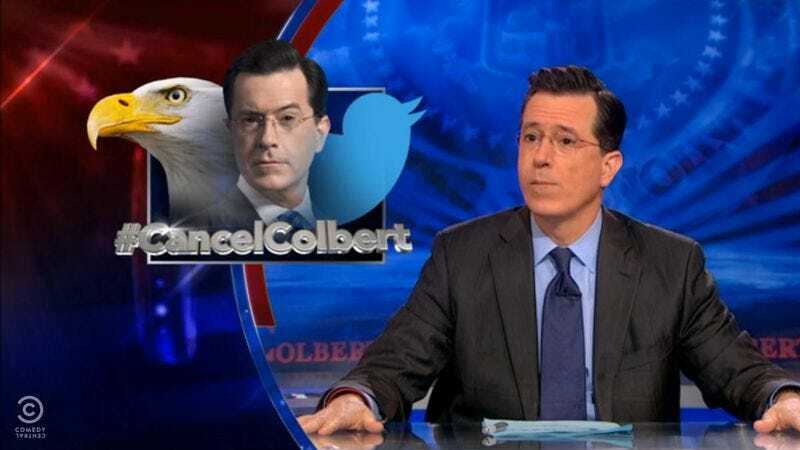 And as the lists were quickly formulated of people who could step in to replace the increasingly translucent, desperately howling Letterman, Colbert quickly shot to the top, emerging as the network’s preferred choice over other rumored candidates such as Craig Ferguson, Chelsea Handler, and Jon Stewart. Obviously CBS agrees, with chairman Nina Tassler saying in a statement, “Stephen is a multi-talented and respected host, writer, producer, satirist and comedian who blazes a trail of thought-provoking conversation, humor and innovation with everything he touches.” Colbert has mostly done so in character so far, as rightwing blowhard “Stephen Colbert,” a persona that will now apparently be put to rest—as the grim flipside of this announcement is that, sometime in 2015, The Colbert Report will be no more, an outcome that few outside of Suey Park and Bill O’Reilly will be happy about. Anyway, with this discussion officially ended—at a far earlier date than we would have predicted—we can all now move on to discussing who could replace Stephen Colbert.